Rising interest rates, weakening credit growth in China, the slowing of China’s economy, trade wars, European uncertainties, currently centered around Italy but by no means restricted to Italy, Japan’s slowing economy, an over-supply of oil, the rolling over of global real estate markets, geopolitical tensions and various technical signals that suggest the 10-year Bull market in just about everything financial is ending. That’s a lot to gag on. The Fed funds rate is up, up and away, accelerating to the moon. No wonder Mr. Market is holding his throat and making panicky motions of distress. Which is worse — too much oil or a scarcity of oil? Depends on who you ask.Suppliers are panicking with prices pushing $50/barrel while consumers were anxious when prices pushed $80/barrel. Who can perform the Heimlich Maneuver on Mr. Market? The European Central Bank has been “doing whatever it takes” for 6+ years, and the central banks of Japan and China have had the pedal to the metal of credit expansion / asset purchases for years. Stop with the rates increases already or Mr. Market expires. And as we all know, Mr. Market is everything to those managing perceptions of the economy. But 2019 is shaping up to be the year in which all the policies that worked in the past will no longer work. As we all know, the Global Financial Meltdown/recession of 2008-09 was halted by the coordinated policies of the major central banks. They lowered interest rates to near-zero, bought trillions of dollars of bonds and iffy assets such as mortgage-backed securities, and issued unlimited lines of credit to insolvent banks, i.e. unlimited liquidity. Central governments which could do so went on a borrowing/spending binge to boost demand in their economies, and pursued other policies designed to bring demand forward, i.e. incentivize households to buy today what they’d planned to buy in the future. The success of these policies has created a dangerous confidence that they’ll work in the next global recession, currently scheduled for 2019. But the next time around, these policies will just be doing more of what’s failed. The global economy has changed. Demand has been brought forward for a decade, effectively draining the pool of future demand. 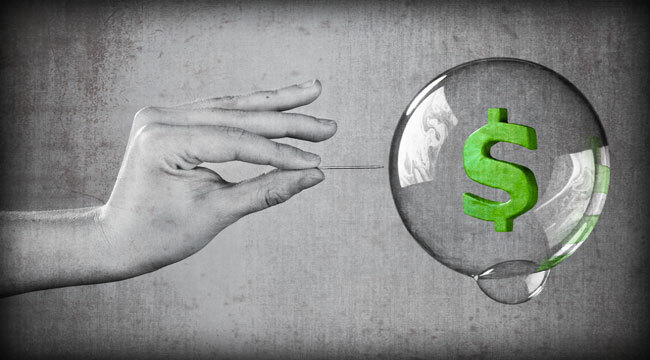 Unprecedented asset purchases, low rates of interest and unlimited liquidity have inflated gargantuan credit/asset bubbles around the world, the so-called everything bubble as most asset classes are now correlated to central bank policies rather than to the fundamentals of the real-world economy. Keenly aware that they’ve thinned their policy options and financial buffers to near-zero, central banks are struggling to normalize their policies by raising rates, reducing their balance sheets by selling assets and tightening lending conditions/liquidity. Unfortunately for central banks, global economies are now junkies addicted to zero interest rates and central bank stimulus/support of bond markets, stock markets and real estate markets. The idea of normalization is to slowly inch the financial system and economy back to levels that were normal in previous eras, levels that allowed some room for central banks to respond to recessions and global financial crises by lowering rates and extending credit to insolvent lenders. As soon as authorities attempt to limit their support, markets wobble into instability. The entire economic structure of “wealth” is now dependent on asset bubbles never popping, for any serious decline in asset valuations will bankrupt pension funds, insurers, local governments, zombie companies and overleveraged households. So how do central banks normalize their unprecedented policies without popping the asset bubbles they’ve created? The short answer is: they can’t.Rising interest rates are a boon to savers and Kryptonite to borrowers — especially over-leveraged borrowers who must roll over short-term debt and borrow more just to maintain the illusion of solvency. As if this wasn’t enough to guarantee recession in 2019, there’s the unintended consequences of capital flows. Capital famously flows to where it’s treated best, meaning wherever it earns the highest yields at the lowest risk. When all central banks pursued roughly the same policies, capital had options. Now that the Fed has broken away from the pack, capital has only one option: the U.S. The Federal Reserve should have begun normalizing rates etc. back in 2013, and if they’d been wise enough to do so then even baby steps over the past 5 years would have led to a fairly normalized financial environment. Owners of assets notice this decay and so they decide to sell and move their capital to safer ground. Selling begets selling, and pretty soon nobody’s left to catch the falling knife. When markets turn and confidence is lost, sentiment can’t be restored so easily: sensing their last chance is at hand, sellers dump assets at a quickening pace, overwhelming the modest central bank buying. This leaves the central bank with a stark and sobering choice: either let the asset bubble collapse and accept the immense destruction of “wealth,” or buy the whole darn market. This is the unintended consequence of employing unprecedented policies for a decade: like using antibiotics every day for years, eventually resistance develops and the “fix” no longer works. Now that central banks have inflated assets into the stratosphere, there’s $300 trillion in global financial assets sloshing around seeking higher yields and capital gains. How much of this $300 trillion can central banks buy before they destabilize currencies? How much can they buy before they run out of political goodwill?